Ready to Overcome Heartburn FAST? Learn a simple 3-step nutrition program to stop acid reflux WITHOUT DRUGS. Print and digital versions available on Amazon. The little-known root cause to heartburn. Big Pharma doesn’t want you to know about this because antacids and acid-blockers are some of the most profitable drugs on the market. A simple explanation using simple analogies for how your digestive system works so you can clearly understand WHY acid reflux manifests and why taking drugs makes the problem worse. Exactly how popular drugs like Prilosec, Pepcid and Zantac work, which can 1. Alter the naturally acidic environment in the stomach (which is essential for good digestion). 2. Cause nutritional deficiencies and bone loss. 3. Keep you dependent on these drugs for years. Why the conventional natural advice for heartburn (eliminate triggers, don’t overeat, limit your intake of fat and reduce stress) is extremely limiting and rarely solves the underlying problem. Why the right types of fats can be incredibly helpful for stopping heartburn, and the four types of incredibly bad fats that you MUST eliminate to achieve good gut health. How a simple, ancient food (that your grandmother probably made regularly) can help stop acid reflux and solve many other connected digestive problems. Why Nature’s true probiotics are more helpful (and much cheaper) than store-bought probiotics. The truth about supplements. Most are poor quality! Only a few supplements are recommended in the book and they are optional depending on your symptoms. A simple 3-step plan to soothe and repair your digestive system so that you not only stop heartburn and GERD, but lay the foundation for it to NEVER return. 50 simple heartburn-busting meal ideas and recipes that not only stop heartburn but promote good health over the long term. I have been heartburn free since about a month after I purchased this book. I followed the steps and have been off Nexium since July. This book is the real deal and if you're suffering from acid reflux or heartburn and feel there is no relief, please, please, give this book a try. You will be amazed and won't regret it. Thank you to the author for giving me this relief. I am forever grateful. I had 24/7 heartburn with severe esophagus burning and an elephant on my chest from antibiotics for 4 months. Prilosec, zantac, pepcid, baking soda, cream of tartar, lemon juice, eating alkaline foods only, not eating at all. Nothing was working. I lost 20 lbs This plan has been the answer for me. It's finally turning around 5 months in. Thank you so much. I found this book to be extremely helpful. After taking prescription acid reflux medication on and off for about 3 years I decided to give this method a try. It took a full 3 weeks (of phase 1) for my reflux symptoms to subside and I have had minimal reflux since. I will never go back to acid reflux meds. I feel so much better! I continually recommend this book to friends who struggle with acid reflux...give it a try! This book changed my life. It opened my eyes to a more natural eating plan and why the body needs certain foods (and not certain foods) to function properly. I have cut my dose of Zantac down significantly after 2 months and still hoping to eliminate completely soon. My husband and I were both on acid reflux medications for years (I was on mine for 20 years and he was on his for 10) and both developed osteoporosis which we learned is a side effect of long term use of proton pump inhibitors. This motivated us to get off these medications and we found Craig's 30 Day Heartburn Solution… We both were off of our medications by the end of the month and went off them gradually as he suggests in the book. We are both feeling the best we have in years and are eating much more healthily and see big improvements overall... As an added plus we both dropped several pounds without even dieting. It has recipes and ideas I could not have come up with on my own and has also helped with other gastrointestinal issues and improved our digestion. We highly recommend the book to anyone with these issues. It is easy to follow and implement with good explanations on why these suggestions work for so many people. After years of suffering with issues such as chronic bloating, reflux, and fatigue, I was ready for a permanent solution that didn't involve drugs. I was tired of simply treating the symptoms and was looking to get to the root cause of my concerns. Craig's program, insight, and easy-to-access information has changed my life! Not only have my symptoms disappeared, but my relationship with food has changed as well. With this book, Craig has given us the gift of healing ourselves in ways that are empowering, healing, and sustainable. Thank you for this amazing resource! I thought I'd go out on a limb and try this book to help my heartburn. I was very skeptical after I first read it and thought it would never work. Well, I've eaten only what the book says to eat for 2 days now and I have not had 1 single heartburn occurrence. It is truly UNBELIEVABLE! I've been taking pantoprazole for years and any time I tried to stop taking it in the past it was like a volcano erupting in my stomach…It is truly a miracle. If you are at all skeptical about this approach to getting rid of acid reflux PLEASE just give this a try. This book was so well written that I purchased 2 additional copies for my family members who are dealing with heartburn. They are currently following this plan with great success and both of them have been able to get off their daily heartburn medication. One family member is even down 35 lbs and was able to get off his blood pressure medication, too. I am so grateful for this book and I highly recommend it to anyone dealing with heartburn! As a practitioner, this book really comes in handy as a patient guide. It is clear and easy for lay people to understand and it helps make my recommendations simple to follow. 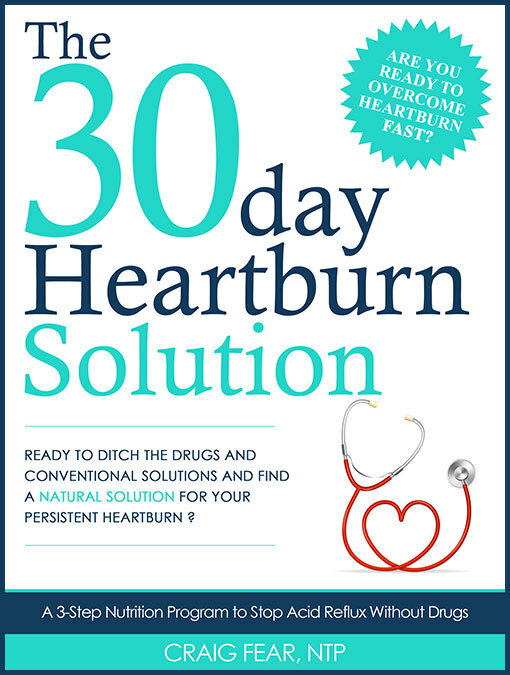 The 30 Day Heartburn Solution is one of the best books around that explains what heartburn really is. Welcome to Your Heartburn-Free Life! 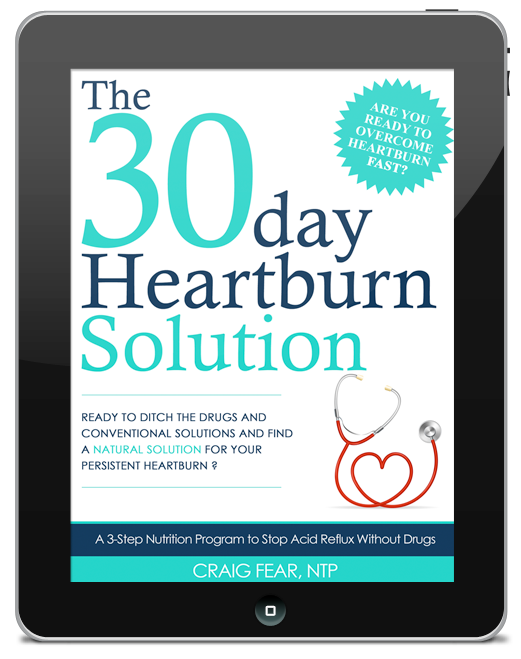 The 30 Day Heartburn Solution will have your digestion running smoothly, without acid reflux and without the need for any more drugs. The 30-day plan uses real food to restore digestive wellness which will help stop acid reflux while also helping to reduce many other connected issues like bloating, inflammation, fatigue, weight gain, nausea, constipation and irritable bowel syndrome (IBS), to name a few. And unlike acid-blocking drugs, this plan is designed to make you healthy, not just take away your symptoms. Most see reduced symptoms in as little as a few days or weeks. What have you got to lose except your heartburn?! 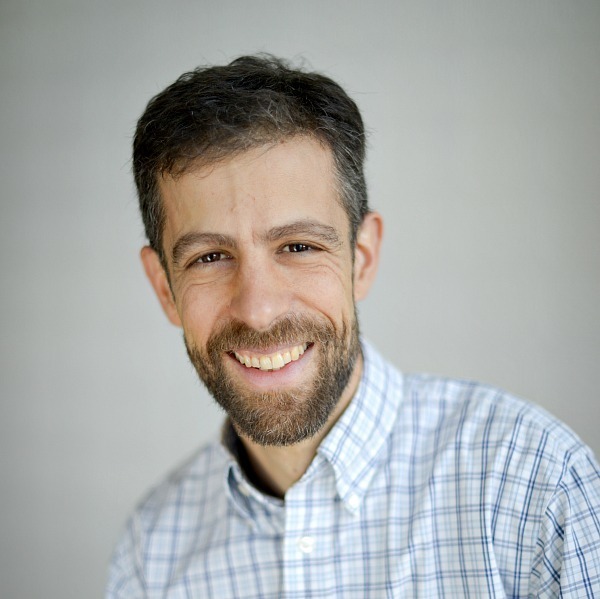 Craig Fear holds a degree in biology from the University of Mary Washington, but his interest in nutrition didn’t take hold until many years after he graduated. After traveling to various places such as Thailand, India, and Burma, Craig became interested in eastern spirituality and began to practice yoga and meditation. After becoming a vegetarian for many years he started to develop chronic digestive issues. It was then Craig decided to study nutrition further. He became a certified Nutritional Therapy Practitioner (NTP) which helped him overcome his digestive problems. He then started working with clients with similar digestive problems which eventually inspired him to share his knowledge in this book. Craig is also the author of Fearless Broths and Soups and The Thai Soup Secret. Learn how easy it can be to stop your chronic heartburn once and for all. It’s not just important for your health and wellbeing right NOW, it’s also important for your long-term health. Order your copy today! Print and digital versions available on Amazon.